Gastro Pubs blend the best of both worlds: casual local pub atmosphere and upscale flavors. This popular dining trend is hot, pairing gourmet bar food with trendy beer and wine. With this Gastro-Pub style burger, you can experience all the flavors of your favorite gastro-pub at home – no man-bunned hipsters required! Bacon and Cheddar are a stellar flavor combo. Pair them with Red Wine and you have a gourmet burger sure to impress the most refined palate. 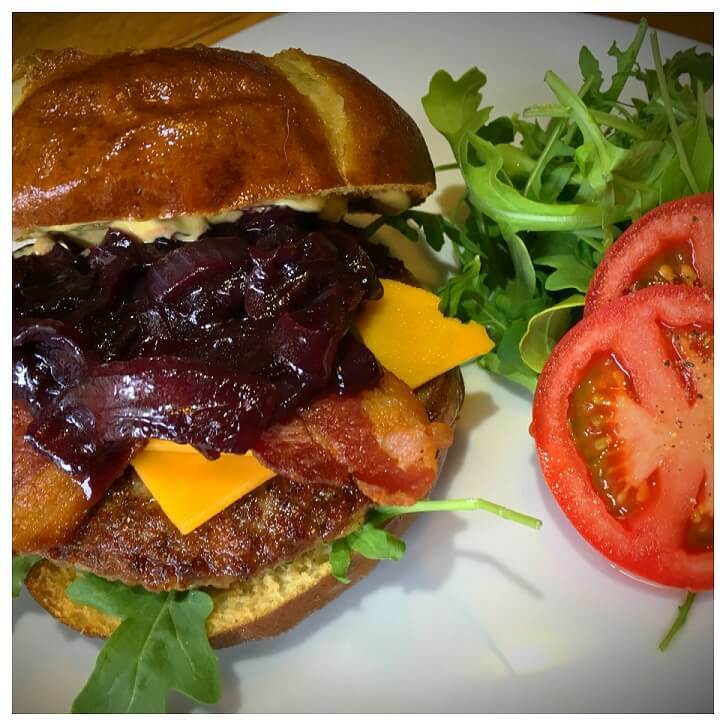 Pair this burger with your favorite micro-brew or Pinot Noir for the full experience! Prepare the bacon according to package instructions. In a small sauce pot, melt the butter and cook until slightly brown, 1-2 minutes. Add the sliced red onion and stir. Cook over medium, high heat, for 6-8 minutes, stirring occasionally. Onions should start to brown. Add the sugar and stir. Cook an additional minute to brown the sugar. Add the red wine, reduce the heat to low and cover. Cook on low for 10 additional minutes, or until onions have become soft. Remove lid and cook an additional 5 minutes, or until wine has reduced and is thickened.Remove from heat. Season with salt and pepper as desired. Keep warm. Melt the sliced Cheddar cheese over the just-cooked burgers. Place fresh arugula on a toasted Pretzel Bun. Place cooked burger on top of arugula. Top with cooked Bacon and Red Wine Onions. Swipe Dijon Mustard on the top of the Pretzel Bun and top the burger.